Chicks sometimes need a little extra help eating and drinking! Chicks need to learn to eat and drink – crucial first skills to master! When you get your new babies, you should gently dip their beaks in a chick waterer and watch their throats to make sure they swallow. You should also check to make sure they are happily pecking, scratching, and eating. Their little crops will be full after they’ve had a big meal. But what if your chicks are not eating? Many times mail ordering delays chicks’ arrival and they’ve depleted their internal supply of yolk and are too weak to eat. This is called starve out. What do you do then? First, it is crucial to separate the weak chicks from the strong ones. Weak chicks are easily trampled and may suffocate under a pile of their siblings. Keep food, water, and heat available to both groups of chicks. Moisten the feed in water and make a thick gruel that is just thin enough to be pulled into a dropper or syringe. Pull the the gruel into the dropper or syringe, and place the tip of the chick’s beak inside. SLOWLY push on the syringe or squeeze the dropper so that food goes into the chick’s beak. Administer the food SLOWLY; if you go too fast, you can easily drown a chick with the food. The trachea and esophagus are very close in the throat. Watch the throat to make sure the chick swallows. If you do not have a syringe or dropper, put a bit of the mixture on your finger and work it into the chick’s beak. Once the chick has regained its strength, monitor it closely to make sure it is eating. Check the chick’s crop to make sure food is getting in, and watch it to make sure it is pecking. 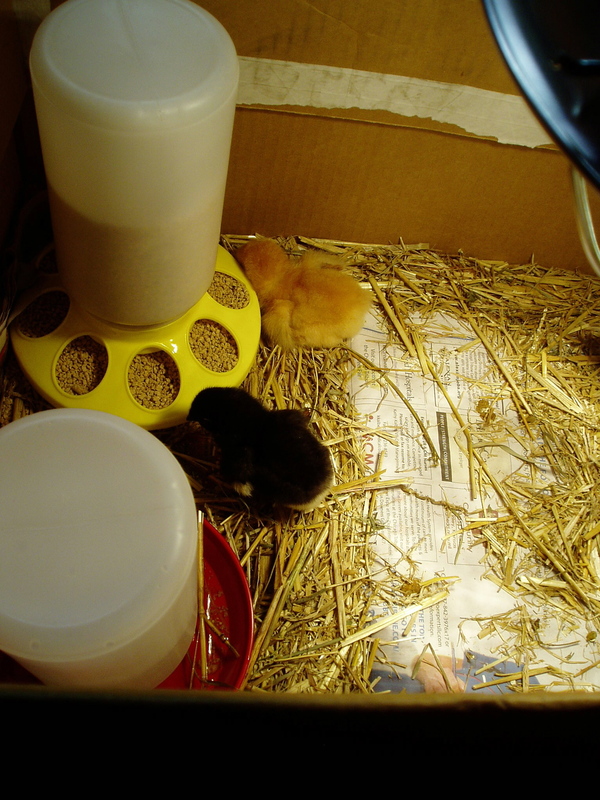 You can scatter food on the floor of the brooder box instead of placing it in the dish only; chicks peck at the ground naturally, and if food is in the way, all the better! Once it is past this crucial stage, reintroduce it to the rest of the flock. Congratulations!